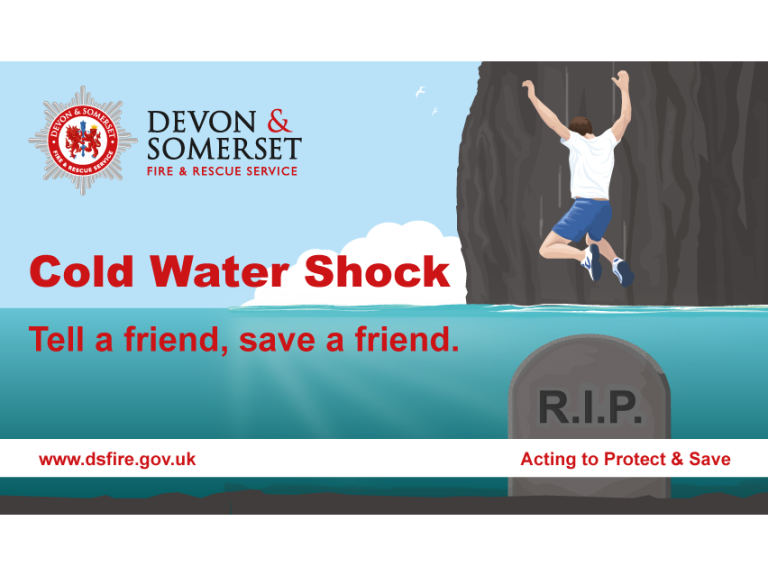 With the warm weather that we are experiencing Devon & Somerset Fire & Rescue Service are advising everyone to Be Water Aware. Drowning is one of the leading causes of death amongst young people. The quarries, rivers, lakes, reservoirs and canals may seem like a nice place to cool off, but there are many hidden dangers. We have already sadly seen a number of incidents across the country of fatalities in Water. Disused quarries are among the most dangerous places to bathe often containing very cold, contaminated water, old machinery and all manner of other sub-surface debris. However Rivers, lakes, canals and reservoirs have many hidden dangers. It is impossible to judge water depth and levels and depths may change considerably. Jumping, tombstoning or swimming in these kinds of locations have led to severe injuries and deaths every year, usually involving young people. Please take a moment to talk to your children about the dangers involved and urge them not to play in these locations. If you are planning a trip to the coast we would also urge you to make use of the many lifeguarded beaches. Many people are unaware of the dangers associated with Cold Water and the phrase Cold Water Shock. Sadly every year many people lose their life through the body’s reaction to being suddenly immersed in cold water. Cold water shock affects our ability to swim and self-rescue. Initial immersion responses – Cold shock response (0–3mins) immediately after immersion in cold water, rapid cooling of the skin causes a number of instinctive and reactions including gasping, hyperventilation, restriction of blood flows, and panic. Short term responses – Loss of performance (3–30mins) following the cold shock response, the hands, feet, arms and legs start to cool and blood flow continues to be restricted. This causes a decrease in muscle strength and endurance leading to muscle fatigue and reduced control over body movements. If the casualty is unable to get out of the water or use a buoyancy aid, this will ultimately result in drowning. Long term responses – Hypothermia (30mins+) over time, significant heat lost causes the core body temperature to drop leading to hypothermia. Firstly call for help, dial 999 and ask for the coastguard if you are at the coast, fire service and ambulance if you are inland. Try and give an accurate location use landmarks or signs and stay on the line. Do not enter the water. It is human nature to want to help but often will only result in two casualties in the water and nobody to direct rescuers to the scene. Shout to them, try and get them to swim towards you, use simple language and commands e.g. swim to me. • Look for lifesaving equipment to throw (life rings, throw ropes) or something to reach out to them like tree branches or clothing, making sure you keep a low centre of gravity so you don’t get pulled in. Just throwing them some flotation might be enough to keep their head above water, anything, even a football or empty container would help.